After a while, the toe will not be able to lie flat at all. This is because tendons in the toe contract over time, locking the joint. Such a toe might suffer other injuries or damage, including corns and calluses because of the toe rubbing against the inside of shoes. While anyone can get hammertoe, women tend to suffer more from hammertoe than men. 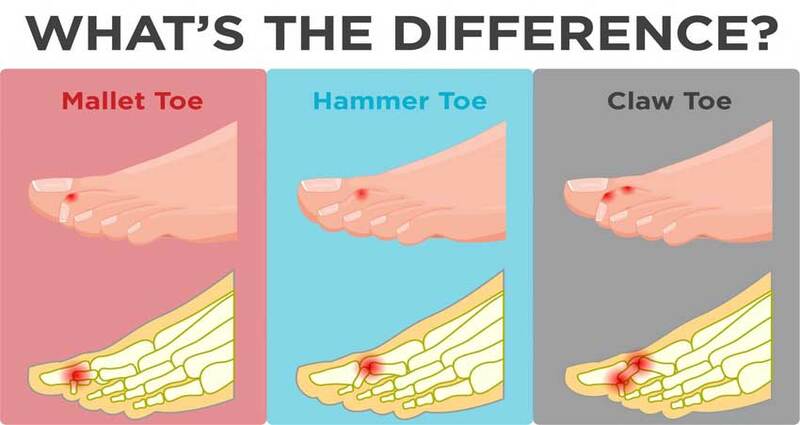 Age plays a part – hammertoe is the type of injury that may follow repeated damage to the toe and so, becomes more common with age. It is also common in people with nerve damage (e.g. from diabetes, stroke, or heart disease). Finally, those with second toes that are longer than the big toe have an increased risk of hammertoe, as the second toe is forced to bend in order to line up with the shorter toes next to it. Wearing high-heeled shoes forces the toes to the front of the shoe, where they may be squashed and bent out of shape in a narrow toe box. Some injuries — such as a stub or a break – can make toes more vulnerable to hammertoe. This is especially true if the injury is not treated properly when it happens. Your podiatrist may advise you to wear wide, comfortable shoes that allow the toes to lie flat, and to steer clear of high-heeled shoes. In some cases, prescription orthotics can be effective to correct the misalignment and allow the toes to lie flat. In extreme cases, where the tendons of the toe have contracted and stiffness or pain affects movement, surgery might be needed. Avoid wearing high heels, or shoes with a narrow (or pointed) toe box in general. Opt instead for a lower heel and a wide toe box that allows your feet to maintain a flatter and more natural position. You should have at least 1.5 cm between the end of your toes and the end of the shoe to allow your toes enough space to move while walking. A soft upper on the shoe will prevent friction and rubbing, and allow your toes a bit of flexibility, which also helps in avoiding corns and calluses. Orthotics can be used to correct your feet back into a normal position. Ask about this custom option if you regularly wear heels but are worried about the damage they may cause to your toes. A podiatrist can also advise you on some exercises that you can do to help stretch the tendons and strengthen the muscles in your toes.